Origin and Habitat: Eastern Cape, Western Cape (Ladismith to Vanwyksdorp in the Little Karoo), South Africa. Habitat and Ecology: Succulent Karoo. Tylecodon leucothrix grows in shaded places, sometimes in full sun, usually on south-facing Swartberg foothills and rocky hillsides and often associated with rock outcrops in well-drained, sandy soil. This habitat is rich in succulents, cremnophytes and geophytes, of which some are rare or localized endemic species (e.g. Drosanthemum sp., Glottiphyllum linguiforme, Haworthia emelyae, Pelargonium ochroleucum, Albuca thermarum, Bulbine ramosa, Cotyledon tomentosa, Crassula badspoortense, Tromotriche choanantha, Gasteria brachyphylla var. bayeri, Hoodia pilifera etc.). Portulacaria afra may also be present. Blooming season summer (November to February). T. leucothrix is an habitat specialist known from five subpopulations. This plant is rare, although its population is considered to be stable early in the twenty first century and therefore not threatened and not threatened. 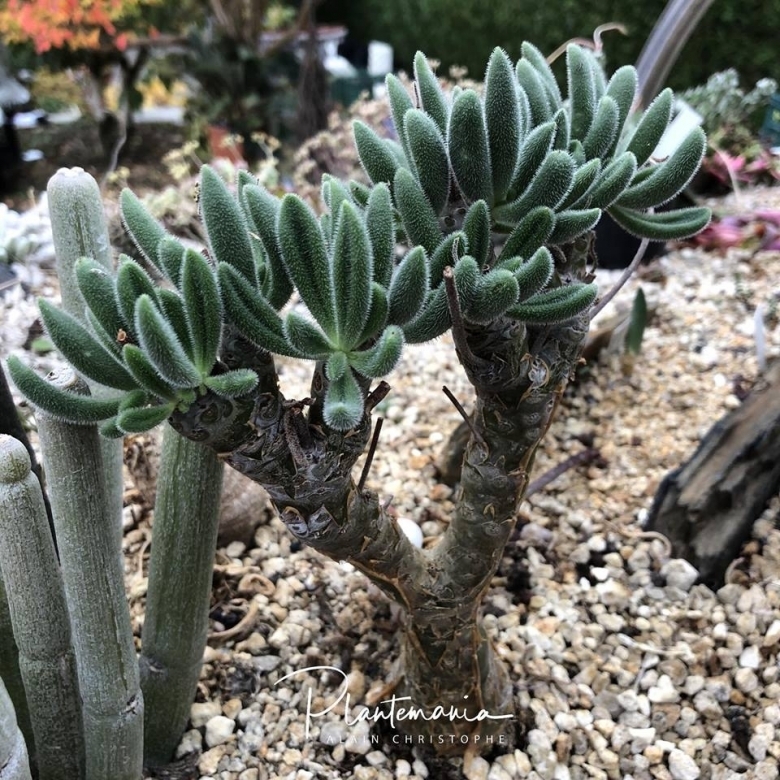 Description: Tylecodon leucothrix, sometimes called bunny ears and in Afrikaans commonly known as doubossie (little dew bush), probably because of the way the dew collects on the leaf hairs, is a succulent shrublet with peeling stems to 20(-30) cm tall from an underground tuber (caudex). The leaves are thickly succulent and covered in dense white hairs and generally dry and drop off in summer. The flowers appearing in summer are tubular, white or pinkish. Derivation of specific name: This member of the Crassulaceae family was given this name by Hellmut R. Toelken in 1978. The specific name leucothrix comes from the Greek words 'leukos', white, glossy; and 'thrix, trichos', hair; for the white hairs on the leaves. Aerial stems: One to several erect or decumbent smooth stems 4-15(-20) cm long, with pale flaking bark. Leaves: Dry at flowering, abscising, oblanceolate to linear yellowish green to green, often turning dark seasonally, variable in length (15-40 mm long), and tapering to pointed tips, crowded at the stem tips. Mature leaves are flattened shallowly channelled on their upper surfaces with a deep median groove, all surfaces with dense white hairs. Inflorescence: A narrow lax panicle or a cyme, glandular-tomentose, few-flowered, the peduncle is 10-20 cm long,erect stalk and emerges from the upper caudex next to the leaves. Flower. Corolla tube yellowish-green to pale yellow. Lobes pinkish-white. 2) Goldblatt, P. and Manning, J.C. 2000. "Cape Plants: A conspectus of the Cape Flora of South Africa". Strelitzia 9. National Botanical Institute, Cape Town. 3) Raimondo, D., von Staden, L., Foden, W., Victor, J.E., Helme, N.A., Turner, R.C., Kamundi, D.A. and Manyama, P.A. 2009. "Red List of South African Plants". Strelitzia 25. South African National Biodiversity Institute, Pretoria.